I've talked about my love of seaweed before. It's super healthy with its fiber, antioxidants, potassium, and iodine. It makes a great salad and an even better wrapper for more tasty things like this vegan sushi. 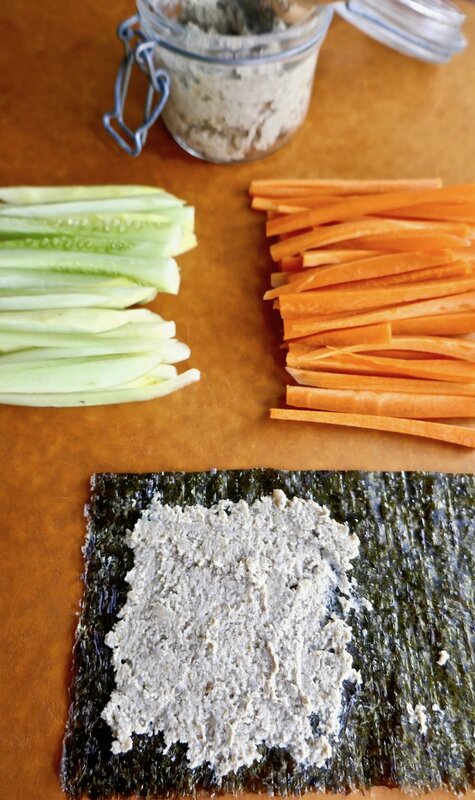 The inspiration for this veggie sushi comes from my food pal Alisa Fleming and her latest book, Go Dairy Free. You may remember me raving about her first book Eat Dairy Free when I made her thai dip with broccoli trees. Yum! Her new Go Dairy Free book has over 250 dairy-free recipes. She also has gluten free, egg free, and vegan options so there's something for everyone here. If you're new to going dairy free, this is definitely a good manual to help you with the transition. Alisa spells out all the great dairy substitutes for things like butter, cheese, milk, and more. She tells you how to shop, eat out, and travel while watching your dairy intake. If you're a dairy free regular like me, you'll also find many different options with chapters that cover breakfast, soup, warm sides, desserts, and snacks. I decided to make her un-sushi snackers because who couldn't use another healthy snack recipe in their lives? You're probably going to want to double the sunflower seed sauce with this recipe. It's a spoon licker. Alisa's veggie sushi includes carrots and cucumbers, but she also mentions other good filling options like leftover roasted sweet potatoes, stir-fried eggplant, or any other cooked vegetables. So mix and match what you like for these gluten free, grain free, dairy free un-sushi snackers. Put the sunflower seeds in your spice grinder or food processor. Process until powdered, about 30 seconds. Put the ground sunflower seeds, water, vinegar, sweetener, salt, and garlic powder in your blender. Blend until smooth, about 1 minute. Scrape the mixture into an airtight container, cover, and chill for 1 hour or overnight. When ready to eat, slather some of the seed butter mixture on one end of a nori sheet half. Top it with the carrot and cucumber sticks, and roll the seaweed up. Repeat with as many as you would like to eat right away. Store leftover seed mixture in an airtight container in the refrigerator for up to 3 days. I was given a copy of the cookbook for review, but all opinions are always my own. This post contains affiliate links, but using them does not change the price of any products for you and goes towards keeping Tasting Page running. Full policy here.